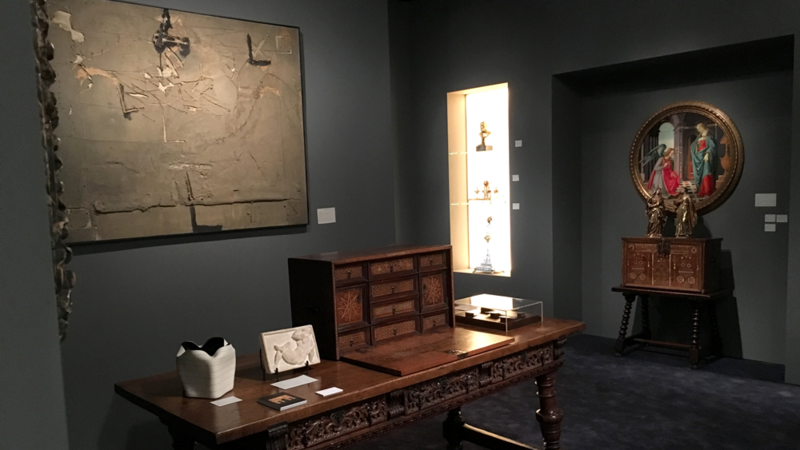 The intimate booth of Barcelona-based Artur Ramon is notable for its seamless presentation of works spanning the ages, from a late 16th-century tempera on panel tondo depicting The Annunciation by the Master of the Apollo and Daphne Legend (far right) to Antoni Tàpies’s 1962 mixed media on canvas, Dominating grey-purple. To the victims of El Vallès (on center wall), displayed alongside choice pieces of 17th-century furniture. Of particular note is a chased and gilt bronze Arch of Constantine (1818) by Prussian émigrés Wilhelm Hopfgarten and Ludwig Jollage. Working in Rome, the duo was known for their architectural models, which were favored souvenirs of gentry on the Grand Tour.